The Finnish software developer Yousician has moved its headquarters to the coworking centre called My Place in La Orotava for four weeks. That way, is is hoped to increase motivation and productivity, because back home, Helsinki is bathed in wintry darkness. A reliable Internet connection is the key," says Andrew Kolokolnikov, the department head of the company which operates the virtual music school www.yousician.com. Coordinator Pauliina Myllytaus added, "when it is very cold in Finland and very dark during the day, a large part of the company moves its workplace to a sunny place. Our goal is to increase motivation and productivity in this way." 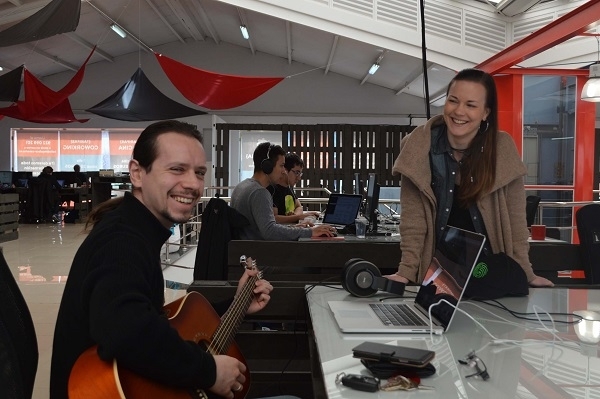 That is why more than half of the Yousician team - who come from 17 nations - have moved their workstations to the coworking centre My Place in La Orotava's San Jeronimo business district for a period of four weeks. Two acoustic bass guitars on the upper floor characterise the area in which the Finnish experts develop algorithms and write programmes that make learning to play musical instruments easy. 09.03.2017 - Often the software developers are holding the guitar neck in one hand while the fingers of the other are tapping on the keyboard in front of the monitor. The team in Tenerife is in direct contact with colleagues in Finland. The whole move would not work without the reliable, powerful Internet connection at My Place. Andrew Kolokolnikov says that, "the inspiring working atmosphere" is also very important. This was the main reason why Yousician chose the European-influenced island of Tenerife and not the tempting charms of exotic regions. For six years, Yousician has been developing concepts that make learning the guitar an easy game. There are also programmes for bass, ukulele and piano available. On the website www.yousician.com you can find the app for learning the basics. The range stretches from the tuning of the instrument to the training units with varying degrees of difficulty. There are even functions that make sure you always get the right note at the right moment. The metronome integrated into the app makes it easy to learn and keep to the rhythm. Music teachers can even write their own songs for their students. The Yousician app is available for iOS, Android, Mac OS, Windows, and Linux. There are free entry-level offers. This new form of music teaching is very much in demand. This is also reflected in the fact that almost two years ago, the number of employees almost doubled in the company, which promotes the slogan "Your personal music teacher!". Produced with news.CMS in 0,0720 seconds.